Nitrofurantoin is an antibiotic is which is used to treat a number of bacterial infections, including a urinary tract infection known as Cystitis. How do I take Nitrofurantoin? 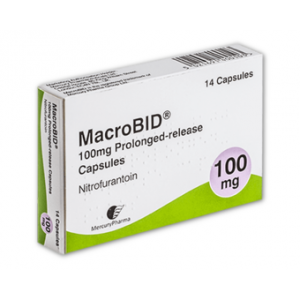 Nitrofurantoin, also sold under the brand name MacroBID, is an antibiotic that is used to treat urinary tract infections (UTIs) such as cystitis. The medicine in available as capsules or a liquid which you drink. Not only can Nitrofurantoin treat UTIs, it can prevent them too. If you experience UTIs often, consult your GP for advice on whether Nitrofurantoin would be suitable for you. Nitrofurantoin works by changing the DNA of the bacterial cells. The cells become weak and can no longer multiply. This makes it easier for your immune system to fight against the infection. To treat a UTI, the normal dose is 100 mg taken twice a day or 50 mg taken 4 times a day. For more severe infections, 100 mg may need to be taken 4 times a day. When taking Nitrofurantoin twice a day, space the time you take your tablets out by 12 hours. This means that if you take one dose at 7am, your next dose should be 7pm. If you are taking Nitrofurantoin 4 times a day, the doses should be spread evenly across the day. Take the first dose in the morning. Take the second dose around midday. The third dose should be administered in the evening and the fourth dose should be taken just before you go to bed. Swallow each capsule whole with a glass of water. Nitrofurantoin capsules should be taken with food or milk to avoid stomach upset. A typical course of Nitrofurantoin lasts between three and seven days. All medicines have the risk of causing side effects, though not everyone gets them. Being aware of the risks which come with the medicine you take is important to your course of treatment. If you notice any side effects, whether they are listed above or in the leaflet which comes with your treatment, you should report them to your doctor. Alternatively, you can speak to a pharmacist. You can use the NHS' Find A Pharmacy service to find a pharmacy near you. Extreme changes of mood or mental state, confusion, weakness and blurred vision. This is not a complete list of side effects and cautions. Further information can be found in the leaflet enclosed with your medicine. Nitrofurantoin can be used during pregnancy. For further advice on taking this antibiotic while pregnant or breastfeeding, speak to your doctor. When taking antibiotics, it is important to complete your course of treatment as prescribe by the doctor. If you stop taking antibiotics too early, your infection may come back. Stopping treatment early may also cause future treatments with this antibiotic ineffective. Do not take this medicine if you are allergic to any of the ingredients of Nitrofurantoin. This medicine contains lactose. If you have lactose intolerance, speak to your doctor for further advice on taking Nitrofurantoin. If you develop the signs of an allergic reaction to this medicine, go to your nearest accident and emergency department. Take your medicine with you. Never share your medicine with anyone else, even if they experience similar symptoms to you. Yes, you can drink alcohol while taking Nitrofurantoin. Will Nitrofurantoin affect my ability to drive or operate machinery? Nitrofurantoin can cause drowsiness or dizziness. Do not drive or operate machinery if you feel unfit to do so. What should I do if I take too much? If you take too much Nitrofurantoin, tell your doctor as soon as possible. Take your medicine as soon as you remember. If it is near your next dose, skip the missed dose and continue taking the medicine as normal. Do not take more medicine to make up for the one you missed. Will Nitrofurantoin affect my contraceptive pill? Your contraceptive pill will still work while taking Nitrofurantoin. However, if you vomit or experience diarrhoea while taking Nitrofurantoin, your contraceptive pill may be ineffective. The leaflet which comes with your contraceptive pill will tell you what to do if this happens. In some cases, thrush can develop after taking a course of Nitrofurantoin. This is because the antibiotic may kill the bacteria which fight against thrush. Speak to your doctor or pharmacist for advice. Tell your doctor if you notice no improvement in 3 days, especially if you notice your symptoms becoming worse. In rare cases, the bacteria is resistant to Nitrofurantoin. If this is the case, your doctor may prescribe an alternative antibiotic. When Pregnant: Inform our prescriber if you are pregnant or intend on becoming pregnant. When Breastfeeding: Inform our prescriber if you are breastfeeding. For simple uncomplicated cystitis - take nitrofurantoin 100mg twice daily for 3 days. Take with food or a milky drink. Improvement is usually seen within 24 hours and symptoms are usually completely resolved after 3 days. If symptoms are not improving or are worsening consult a doctor.